Limb reconstruction is a long, drawn-out process that can last over a year and it can be another year before you start to feel the real benefits. It may be painful, with frequent operations, and can require a good deal of courage. However, it can heal fractures that have stubbornly refused to respond to other treatment, and help limb deformities, so vastly improving your mobility. Successful limb reconstruction treatment can appear like a miracle cure but it is not an easy choice. People going through this surgery often have severe emotional, physical, and practical problems. Job losses, financial pressure and breakdown of relationships are not uncommon. The inability to walk or drive leads to reduced independence, and increased reliance on others. Unsurprisingly, you may suffer a loss of self-esteem. For some, clinical depression follows. A few patients conclude that this arduous prolonged treatment is not for them and make the difficult decision to have an amputation. 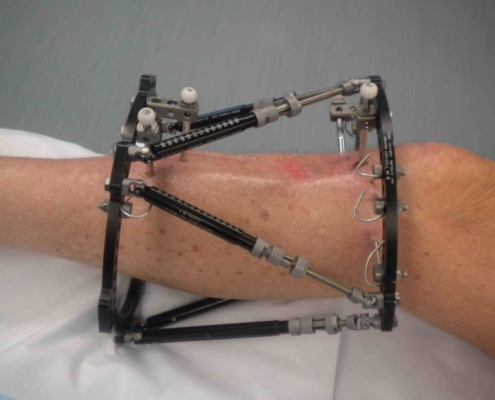 An external fixator (frame) is applied to the limb in surgery. Frames can be used to stretch and/or lengthen limbs. A surgeon makes a tiny incision in the bones, pushes the pins through the bones and attaches them to an external fixator. If the bones are being treated, then the surgeon will also perform an osteotomy (surgical division of the bone), carefully preserving the soft tissue attachments and blood supply to the area. The limb is now at a point where it can be gradually corrected at home by the patient, who turns a screw or a nut on the frame. The surgeon gives precise instructions about how far the frame should be adjusted each day. The gaps in the bone that are created by adjusting the frame are filled in by the patient growing new bone. Patients have regular x-rays and reviews until the surgeon is satisfied that the correct position has been achieved. If the limb is stretched too far or over-corrected, the surgeon can alter the daily instructions in the opposite direction. Once the deformity has been corrected, the frame is fixed in that position. There are no more daily alterations. This stage usually takes a few months because the bone can only be lengthened by 1mm per day allowing the bones to fix. For the NHS, the Limb Reconstruction Service brings to an end the cycle of prolonged morbidity, multiple interventions and conspicuously large consumption of NHS resources, It is undoubtedly a cost limiting service. For the economy, the Limb Reconstruction Service restores working age adults to the workforce. What is the demand for the Limb Reconstruction Service? Demand is growing, with the annual number of referrals rising from 40 in 1996 to almost 200 in 2017. Patients who have been previously advised to accept disability are now more aware of reconstructive possibilities; also there is a greater awareness of the service at KCH. Is demand likely to change? The trend is clearly increasing. Changes in the training of orthopaedic surgeons, which will be shorter in training posts and hours spent per year, will mean that complex trauma will be referred to specialist centres much more frequently. KCH is already experiencing this with the establishment of the Major Trauma Unit (MTU). Patient expectations change and increase all the time. Disability that was formerly accepted is now accepted much less often. Awareness of reconstruction techniques is more widespread and more information is available on the internet. How many specialist units are there in the UK? There are a few limb reconstruction units around the country, though KCH may now be one of the largest. There are also surgeons working in isolation in other hospitals. The British Orthopaedic Association Survey reveals that fewer that 1096 of all consultant orthopaedic surgeons declare trauma as a special interest. Limb reconstruction is a subspecialty within trauma: an even smaller number of surgeons are available to address the needs of limb reconstruction patients. Limb reconstruction, as a speciality, is generally attributed to Gavriil Ilizarov, a Russian Jew who worked in isolation in Kurgan, a city east of the Urals, from the late 1940s until his death in 1992. 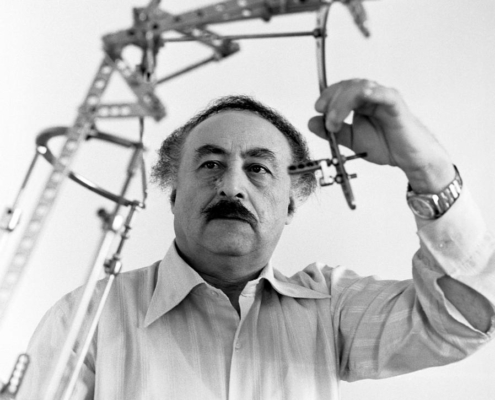 Ilizarov developed techniques for creating new tissues (histogenesis) using an apparatus which applied slow steady tension (distraction) to injured tissues. He discovered a new biological principle (the Law of Tension Stress) by means of which adult cells could create new tissue. His work was the first example of what we might call tissue engineering. His patients were the war-wounded of whom there were huge numbers. His astonishing work was not widely known in Russia until it was almost fully developed and reach the West, via Italy, in the late 1970s. It was adopted in the UK in the late 1980s. Ilizarov techniques were first used at King’s in 1993. Other techniques are also used in the Limb Reconstruction Service, but the service has come to be defined by the Ilizarov method.